There are always the risks faced when running a company. The risk comes either from internal or external which made the company suffer losses. The purpose of this research is to understand more the implementation of Enterprise Risk Management in attempt to identify a Digital Printing shop risks that exist within the company that are used to anticipate the arise of the risks. The digital tavern of CV. 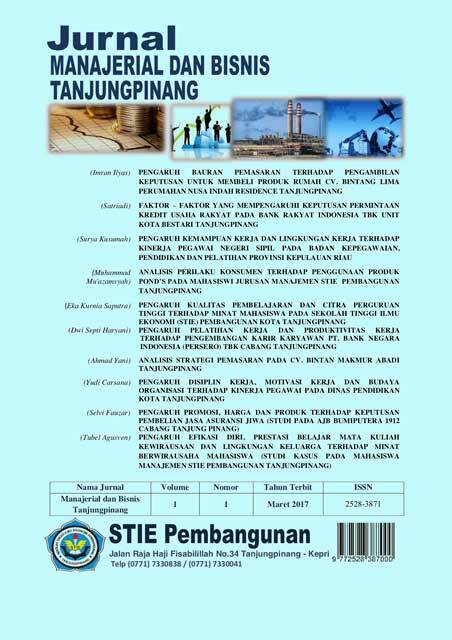 DUTA KARYA UTAMA is an object of this research. This study uses qualitative methods by using method of interview and observation. It is recommended for using ISO 31000 as risk management approach to resolve risks properly. This research showed that there are 15 risks in the company. It should be noted that the company risks haven’t been handling is the cause of the company loses. The company is required by handling the risk properly so the company can run the company’s operational activities more effective and manage the risks involed better and proper as well as in accordance with the level of risk faced by the company.